Our friendly Eye Exam and Optician Team at EyeCare Optometric Center are here to meet your every vision health need. They are an integral part of our total team – focused on serving you. A California native, Dr. Michael Frisch earned his Doctor of Optometry from The New England College of Optometry in Boston, MA in 1985. He did his undergraduate work at University of California, Los Angeles and California State University, Northridge receiving his Bachelor of Arts in the Biological sciences in 1981. 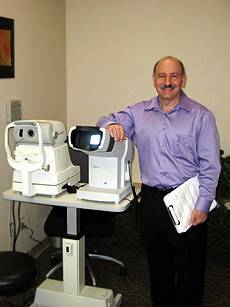 He founded EyeCare Optometric Center (of Northridge) in 1989. Dr. Frisch serves as a senior clinical examiner for the National Board of Examiners in Optometry supervising other optometrists and testing optometry candidates for licensure. He served as a clinical teaching assistant in the past. He is also a member of the Orthokeratology Academy of America. Dr. Frisch has a strong interest in diseases of the eye and is board certified by the State of California in the treatment and management of ocular disease. He has completed additional postgraduate work in laser vision correction and orthokeratology. Other interests include dry eye therapies, keratoconus, hard to fit contact lenses and Gentle Vision Shaping (wearing a contact lens overnight, removing it in the morning and eliminating the need for corrective lenses during the daytime). He also co-manages and is a consultant for laser refractive surgery. Outside of the office Dr. Frisch has a passion for landscape photography. His work has won several awards. Other interests include hiking, target shooting with various caliber revolvers and mountain biking. Dr. Frisch resides in West Hills with his wife Sharon, his son Corey and 2 rescued dogs (Tarzan and Jane). Jennifer is our office receptionist and is a native of California. She holds a Bachelor of Arts in Sociology from the University of California at Santa Cruz. Her warm smile is what most patients see first when they enter our office. She is attentive to detail and is highly skilled in office procedures, especially reserving appointments, verifying insurance eligibility and answering any questions about your visit. On weekends Jennifer enjoys dancing, working out the gym, shopping and trying new foods. She is the proud owner of two dogs a finch. She tries to please our patients in any way she can. Lyra was born in the Philippines and raised in So. California. She has extensive experience in the fashion industry and has a flair for style. You can be assured the eyewear she recommends is best suited for your personality. She has been a dedicated member of our team since February 2008 and will serve you beyond your expectations. On her days off Lyra enjoys rock climbing and especially shopping. She will be happy to entertain any shopping-mall related questions you may have! Andrew, born and raised in Southern California, is the newest optician on our team. He has a true passion for the eyecare industry and delivers the highest standards of patient care. Our patients routinely comment on Andew's affable, professional and outgoing personality. He expects every patient to leave our office with fantastic vision along with a smile on their face! On the weekends you may find Andrew playing poker, going on his own L.A. area adventures or catching up on his favorite Walking Dead or Gordon Ramsay episode. He enjoys the company of others and is a great addition to the EyeCare Optometric Center family. “Amy”, as she is affectionately called, has been serving us since the late 1980’s. She works 24 hours a day and 7 days a week scheduling your appointments and allowing you to order your contact lenses at any hour. She keeps our office extremely organized and never complains about anything.